Rechargeable Battery For Arlo Security Camera – Li-ion rechargeable battery works with Arlo Security Camera Seamlessly. COMPATIBLE CHARGER – Use ONLY Tenergy 3.7V RCR123A Arlo Battery Charger (B01MRKGO09) to charge these batteries. Using other brands or models may result in incomplete charge of batteries and short run-time. BOX CONTENTS - Package comes with 4 x Tenergy 3.7V Arlo Security Camera Battery and includes 1 year warranty. Works with Arlo Wire-Free HD Security Cameras (VMC3030/VMK3200/VMS3330/3430/3530). Do not mix use this Tenergy Li-ion 3.7V 650mA rechargeable RCR23A battery with any other rechargeable RCR123A batteries. *It is possible rechargeable Li-ion RCR123A batteries may have shorter run time that your original disposable lithium CR123A batteries, depending on their capacity. **This rechargeable battery is not intended to prolong the run time of each battery, but to offer the convenience and savings over the life of the battery so that you will not need to buy and dispose non rechargeable Lithium CR123A batteries continuously. I thought you are not supposed to use rechargeable batteries with Arlo? 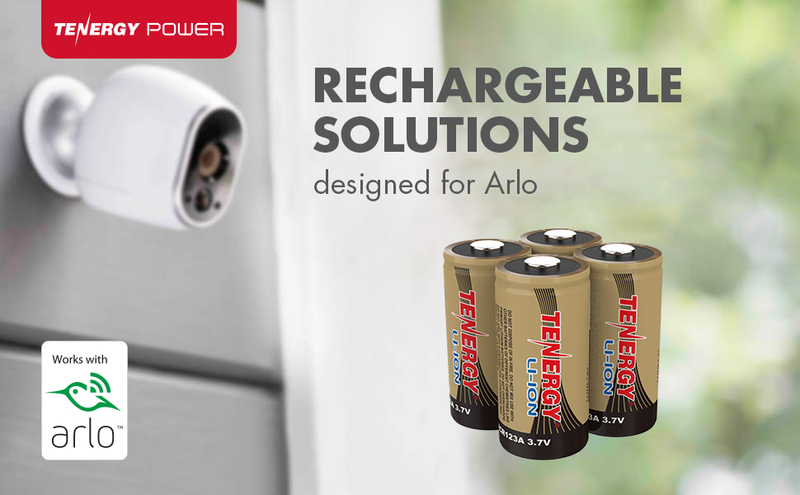 Tenergy's rechargeable CR123A batteries certified to Arlo to work in their camera devices. Look for the "Works with Arlo" logo to confirm that Arlo has confirmed compatibility. We have a 1 year warranty for this item. If you are experiencing issues, please contact us at service@tenergy.com and we can help further assist you. How do you recharge the batteries? Please use a compatible Arlo battery charger like part number 02460. Generally our customers experience up to half the battery life of regular non rechargeable batteries. The main benefit is the rechargeable nature removing the need to repeatedly buy new replacement batteries. This Tenergy Li-ion rechargeable RCR123A battery is intended for use in Arlo security cameras only.